I figured it might be useful to provide a quick ranking of the various transatlantic business class seats. I’m ranking these exclusively in terms of hard product, and doing so very broadly. I’m simply ranking what I consider to be the best general types of seats, and then listing the airlines that offer those. 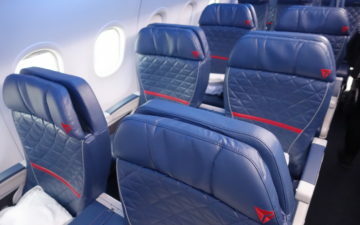 Why I love reverse herringbone seats: These seats are just about comparable to some first class suites out there, and really make you wonder if there’s a need for first class anymore. They offer so much privacy and personal space that they’re easily the best business class hard product out there. There are also no bad seats — every seat has direct aisle access and is private, unlike some other configuration, where you may end up seated in a “honeymoon” seat with a stranger. Why I love staggered seats (Solstys style): There are two types of staggered configurations out there. The technical term for this type of seat is Sogerma Solstys-style seat, but that doesn’t exactly roll off the tongue. This configuration offers so many different types of seating options — you have window seats that are right by the window with lots of privacy from the aisle, window seats that are closer to the aisle, private center seats, and even “honeymoon” seats in the center section, where you’re seated as close to your seatmate as you would be in economy (by design). For what it’s worth, I far prefer the “true” window seats in this configuration. What makes these seats better than the other style of staggered business class seats is that the legroom isn’t restrictive. In the other configuration there’s very limited legroom, so it can be tough to sleep if you’re not petite. Why I like herringbone seats: Back in the day herringbone seats were the cutting edge business class product, I believe first introduced by Virgin Atlantic. They’re still quite decent though a bit claustrophobic compared to other products out there. I do like how private they are, though the downside is that if you’re traveling with someone there’s no way to really “sit” next to them. Why I love staggered seats (Vantage style): While the technical name for the other staggered configuration is Sogerma Solstys, this one is technically called Vantage. These seats do have a bit of privacy, though the downside is that the legroom is highly restrictive. That’s because of how the seats are designed — the foot “cubby” for each seat is located between the seats in front of them, so the space is quite limited. Why I like fully flat seats: I mean… well… they’re fully flat. Why wouldn’t I like that? 😉 So this is the category for all the fully flat seats that don’t fall into one of the above categories. Why I don’t like angled seats: Because my idea of a good night of sleep doesn’t involve a dentist office. Hopefully that’s a useful rundown. I realize that my interpretation of “transatlantic” is pretty liberal here based on some of the aircraft types listed (like is a flight to South Africa really transatlantic? ), but I’d rather add too many airlines than not enough. Also, as I stated at the beginning, not all of the above products in the same category are created equal. For example, all else being equal I’d hands down take Etihad business class over US Airways business class, even though on the surface US Airways has my preferred seat type. So take this as a general guide, and not an airline-by-airline comparison. Hopefully it’s helpful nonetheless. Do You Dine Alone When Traveling Internationally? Thanks! Great roundup of very useful info. LOT doesn’t have any 767 left. For me the USAir seats aren’t wide enough at the shoulders for me to lie flat. Also, the foot cubby really isn’t big enough for my feet. Is there a seat type that tends to be wider at the shoulders and with a bigger foot area? I’d trade that for fully flat/privacy, etc. Actually, Lucky, Swiss is like a weird hybrid of the 2 staggered styles. The left and center seats are Vantage style, while the seats on the right are Solstys style. You end up with every 2 rows being a 1-2-1/2-2-1 configuration…not sure how it would be categorized. Thanks! What would you say has the biggest foot cubby? @ mp — Ultimately anything except the one version of the staggered product should have plenty of room for your feet. @ Todd — For what it’s worth US Airways offer one of the first reverse herringbone business class seats, so the subsequent versions do seem a bit more spacious. @ Franek — Thanks for the correction, didn’t realize they already got rid of them. Updated the post accordingly. @ MYS — They offer a fully flat product on the A380 and angled product on the A330/777. But they don’t fly transatlantic, which is why I didn’t include them. how come you have Emirates as having angle seats ? I though they have the cutting edge of everything in the sky. In regards to your twitter question from yesterday, how about calling the Soltsys seats honeycomb seats? They look a bit like honeycombs. @ choi — They don’t. Their 777 business class seats are all angled. I thought the KLM 747s have been updated with fully flat seats. Not sure how they would be categorized but World Business seats are advertised as fully flat. How about doing the same for transpacific? KLM has full flat seats (B/E Diamond) on their 747’s. this is super helpful, thank you. You should check out the AF site for their new Business Class seats that roll out beginning in June. No more Angle-Flat! UA has some 744 TATL service, say ORD-FRA. I’m flying UA929 LHR-ORD in United Global First 767-300 and UA918 IAD-LHR in United Business First 777-200. Do these both fall under category 5 of fully-flat seats? @ baxterboy12 — The first class seat kind of falls into a different category since it’s more of a “suite” type seat, but the business class seat would be a standard fully flat seat. 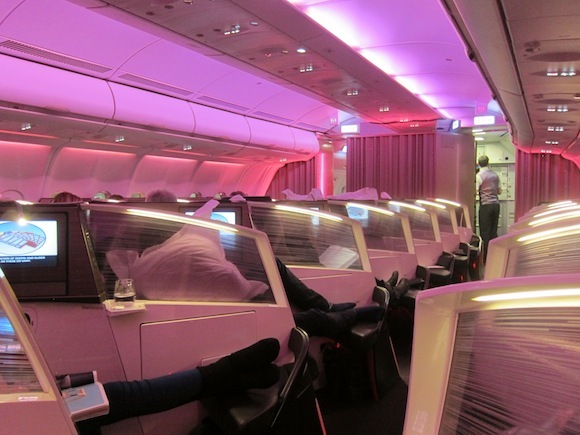 I’ve booked two roundtrip business class awards on AY A333 for 2014 Xmas Europe vacation. Checked seat plan on AY website and found it’d be 32 J seats (the newer fully-flat configuration). Actually I’m still waiting for AA 77w to open a pair of seats on those dates (currently ZERO space). Any idea if AA will open up award space in second half of this year? @ Zhuo — American is really stingy with transatlantic award space. I wouldn’t count on it opening up. You can also add Air Canada in Staggered seats (Vantage style). 777 high density is operating on YUL-LHR and YUL-CDG. @ Valerie — Whoops, just added them. The 777s have a fully flat product, while the A330s have an angled product. BA seat probably warrants its own subdivision given it is pretty unique. Have not flown reverse herringbone yet, but does not strike me as good for couples or parent/child. Solstys seems better option in those cases. e. SQ’s seat, which is its own thing entirely … kind of a hybrid of straightforward (when you’re sitting up) and herringbone (when you’re lying down). Doh! Didn’t realize they had a 5th freedom route LHR-LAX. Can you do the same for transpacific? How would ANA and JAL compare? Thank you and great post. I will make sure to bookmark it for future award travel. 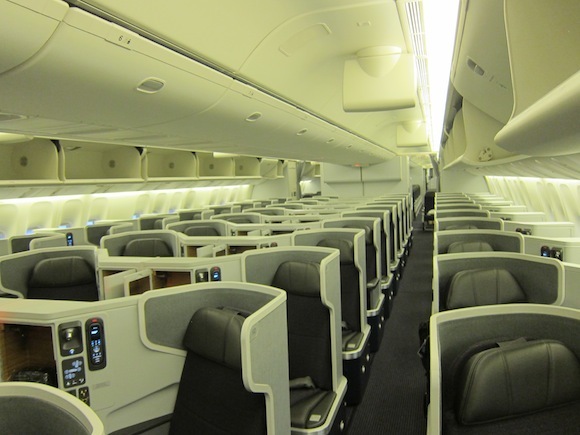 @lucky – are all of IB’s transatlantic fleet fitted with fully flat seating in J now? @AJK: Google “Air New Zealand flight 2”. @snic — yeah, I got it 13 seconds after I posted that. See the immediate post afterwards. For seat #4, I understand why Delta utilizes it on the 767 due to the restricted fuselage width. The fact that others use it on bigger birds is a bit surprising, as other configurations would be much more desirable to the customer. Oh well! @ EthaninSF — The entire longhaul fleet has fully flat business class seats, but not all of them have the staggered seats yet. As stated in the Would You Fly BA, TAP or Kuwait, the TAP A330 is fitted with fully flat seats. 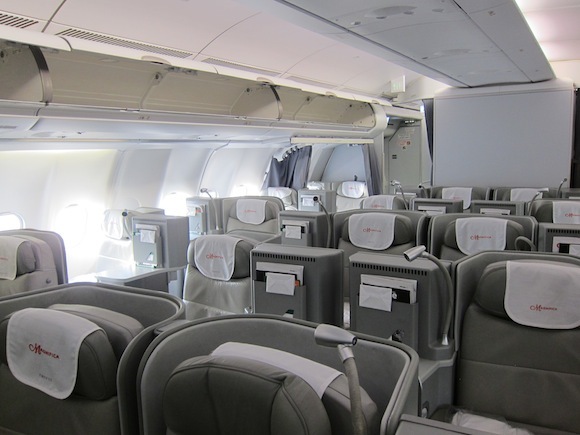 The Air Canada High Density 777-300ER flying from YUL-CDG have the Vantage style seats. @lucky – I think you forgot about Eva Airways and their reverse herringbone on the triple 7s. @ Matty Love — EVA Air doesn’t have any transatlantic routes. 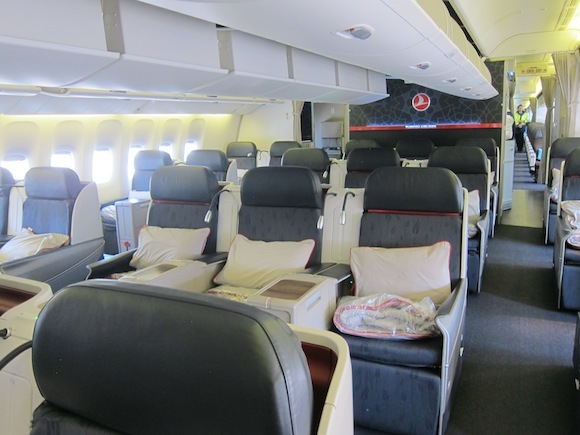 Air Tahiti Nui, an AA partner, has angled fat seats in their business class on their nonstop from CDG to LAX. I just booked one for next April returning from Paris. Though I had other options (on AA/US Air) with better seats, they all involved a connection, and for me the nonstop aspect trumps comfort,. @ Stuart Falk — Great catch, thanks. Added them to the list. 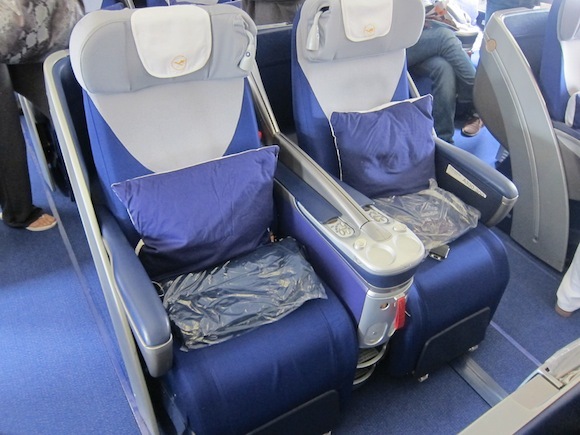 Lucky- Aeroflot has two different seat setups for its 333, 9 of 17 have lie flat seats. For the 5 332, I think they’re all converted to the new seats now. SU is using the B/E Minipod similar to KE, except the colors are the orange/blue combo. I agree, with the exception that I would rank BA 62/64 A/K as the top transatlantic seat on their 747. The thing I love most about BA CW is the upright position has more of a recline than any other product, which makes it really comfortable during taxi, takeoff and landing. American are now rolling out the Vantage seat on their 767s across the atlantic, starting with JFK-ZRH. Again, another post that I will bookmark. It’s funny, the seat is actually more complex then one would think. For example, if I am travelling with my wife or kids, I certainly would take the angle flat over Herringbone seats. However if its a short night flight, and all I want to do, then maybe the Herringbone would be above. Also the age of the seat and if it is properly working or properly padded. I have been on some, that the seat did not move to its proper positions and the flat seat, was anything but flat. Doesn’t make for a good sleep. The DL 767 lie flats feel like you’re in a coffin! I was wondering where DL flies 747s across the pond. While most go to Asia, there’s one flight JFK-TLV. I think the US Airways 757 can also be added to the angled flat list. @ Coutureguy — Updated, thanks! @ Ivan Y — Yep, ouch! I don’t mean to be picky, but ANZ doesn’t have herringbone seats. For a true herringbone, the top of one seat in the center has to be staggered from the one it’s next to. The ANZ seats (Contour UCS) have the top/aft of each pair of center seats at the same position. *one. Never mind, they all look similar anyway. Thanks for this post. It’s very helpful to those of us who aren’t as familiar with the configurations. 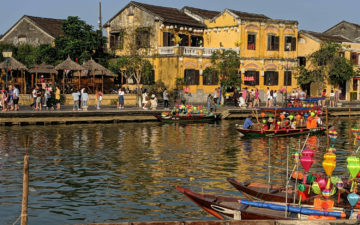 Lucky—Can you do a similar article for transpacific business class seats? It might be helpful for folks who travel to Asia from the west coast. Thanks so much! You left out Kuwait. They fly 777 recliners. Thank you for clarifying the different types of seats out there. However, I do believe that LH’s new business class seats (with the brownish/orange colour scheme) would be considered a form of reverse herringbone. Correct me if I’m wrong. @ Noah Sprenger — I guess it’s a function of semantics, but generally herringbone/reverse herringbone seats refer to configurations with all aisle access, in my experience. Hi, maybe I’m using the terms differently than you do, but the last 2 categories confuse me: Couldn’t any of the first 4 either be full flat or angled? I.e. LX has vantage, but they are also full flat IMO. Their first try on the A340 wasn’t, but they have moved away from that fortunately. @ Gabby — Correct, though when I say fully flat or angled I’m referring to forward facing seats that don’t fit into any of the other categories, if that makes sense. Etihad A380/787 business seats are actually more similar to a (narrower) reversed Club World-like yin-yang configuration, and they do fly transatlantic. They should be classified as fully flat. Interesting article but curious to know what QANTAS offer Transatlantic. They do a New York to Heathrow leg. Otherwise all my ‘choice’ of airlines are covered.